For rifles in 30 caliber, these bullets are designed for medium- to long-range hunting with cartridges having medium to large case capacities for powder. These bullets often display match grade accuracy from accurate hunting rifles. The famous Sierra Spitzer Boat Tail shape assures flat trajectory, excellent resistance to crosswinds and vertical winds, and maximum energy delivery to the target. Good penetration and expansion are characteristic of these bullets even at the reduced impact velocities at long range. With the weight range available, at least one of these bullets will prove ideal for almost any 30 caliber cartridge. The 180 grain #2160 has no restrictions for large game but are best when fired at maximum hunting velocities. All of these bullets deliver exceptional accuracy, and the 180 grain #2160 was used to win the prestigious 1000 yard Wimbledon Cup in 1953. In handguns chambering 30 caliber cartridges, prior to the introduction of the Remington Model XP-100 (and similar handgun designs) utilizing larger rifle cartridges, the usefulness of these bullets was limited. Now, these bullets have a very definite niche as superbly accurate hunting bullets. Previously considered "too hard" for expansion, they perform well at the 2500 fps muzzle velocities achievable in the 308 Winchester and larger cartridges. Ease of loading and precise concentricity contributes to their excellent accuracy. Sierra's Spitzer Boat Tail design assures flat trajectory and high energy delivery downrange with low sensitivity to crosswinds and vertical winds. 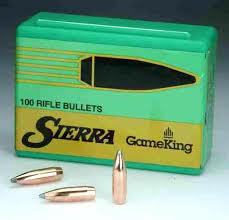 These bullets are suitable for varmints through large game at all ranges a prudent handgunner would normally attempt. The 180 grain #2160 bullets are favorites of the silhouette shooters and long-range competitors, but are too "hard" for most hunting applications.